Rentec Pro and PM subscribers can use the Forms Editor to create a document with data fields that will automatically pull relevant tenant or property information and automatically input them into the form for you. Under the Settings tab, select the option labelled "Forms". Forms are like templates that will be populated with information at a later time. To add a new form click "Add Form" on the left side of the page. Enter database merge fields in the body of your message to have the system automatically insert those values. Use the Preview button to test with sample data. If you have an existing document and want to copy it into Rentec's form system, the way to do this is via copy and pasting it over. For example, open the document in your existing document editor. Select all the text within your document (CTRL-A is a shortcut for this), then push CTRL-C on your keyboard (or right-click and choose Copy) to copy it into your computer's memory (aka, clipboard). Return to Rentec Direct and create a blank form (or edit an existing one). Place your cursor inside the form where you want the text to be placed and press CTRL-V on your keyboard (or right-click and choose Paste). This will move the content from your original document into the Rentec forms system. The Rentec editor will attempt to maintain formatting; however, depending on the source sometimes the document formatting may need to be manually corrected to look right. You can press the Preview button at the bottom of the page to see what the document will look like when printed at any time. If you have an existing .pdf document that you would like to copy and paste into the forms editor, you will first need to convert the file into another format such as an html document. CloudConvert.com is a website that converts .pdf files into .html files. You can use their site to convert your .pdf file and then copy the text from the converted .html file into our forms editor. Send a Form to a Tenant or Owner via email. Any Form can be sent through DocuSign to be electronically signed by a Tenant or Owner. Tenants and Owners have access to Forms completed via DocuSign in their File Library through the Tenant or Owner Portals. A new form field named “DocuSign Initials” allows DocuSign to request the signer’s initials at various points throughout the form. In the Form template editor, a Page Break field has been added to the drop-down fields selector. You can now control exactly where your form content will skip to the next page. After insertion, the field appears as %PAGE_BREAK% in the editor and in the Preview or final PDF document it does an actual new page. All your form templates (except Drafts) will be available in the drop-down selector. A Forms option and a File Library option have been added to the Owner’s drop down menu. 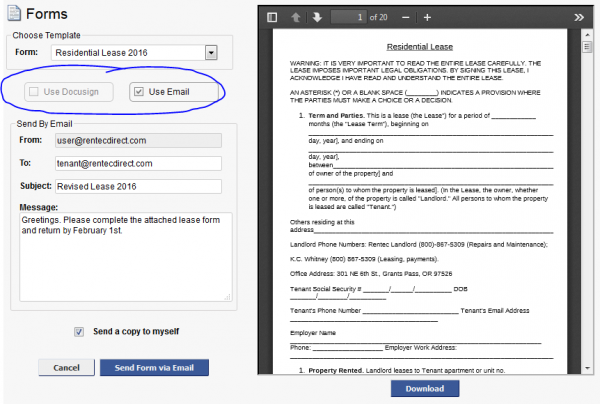 To send a form via email, with the appropriate fields completed from the data in the tenant or owner records, select Forms from the Tenant or Owner popup menu. On the Forms page, below the template selector, choose the delivery option. If you are using Rentec Pro or PM and have additional user accounts, you can specify whether these accounts have permission to add/edit Forms. Open Manage User Accounts under the Settings tab then select a user whose permissions you wish to edit. “Allow access to Forms” is required to edit forms. Please use caution when granting “Allow access to send Forms electronically via DocuSign” as each envelope will have a cost associated with it.